Melt 1/2 cup butter (1 stick) and blend in graham cracker crumbs with a fork until evenly moistened. Press into the bottom of a 9×13″ pan. With an electric mixer, blend remaining 1/2 cup (1 stick) butter with cream cheese, confectioners’ sugar, and salt. beat 3 to 4 minutes until fluffy. Spread mixture over graham cracker crumbs. 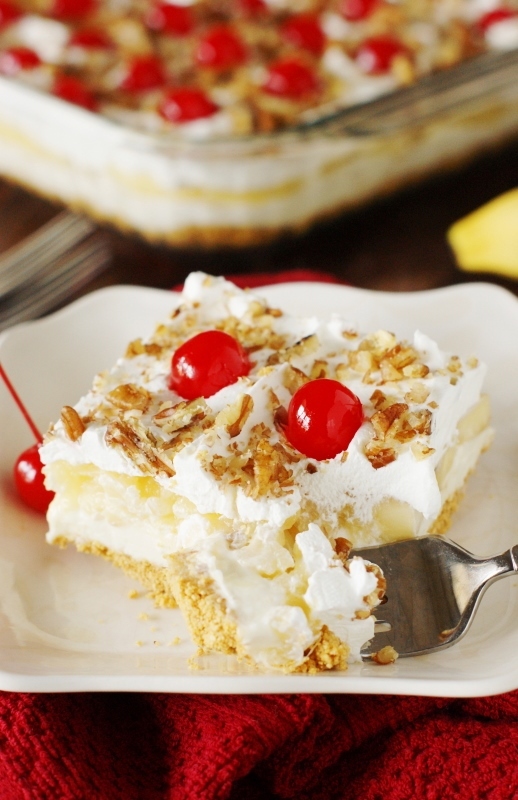 Slice bananas and arrange evenly over cream cheese mixture; top with crushed pineapple. Spread Cool Whip on top of pineapple; sprinkle with chopped pecans and place cherries on top. Cover and refrigerate at least 2 to 3 hours, or overnight, before serving.